Christopher J. Devine is an Assistant Professor of Political Science at the University of Dayton, in Dayton, Ohio. 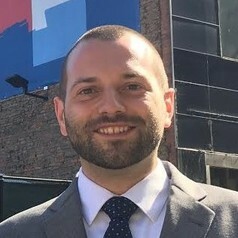 He earned his Ph.D. in Political Science from The Ohio State University in 2011, with concentrations in American Politics and Political Psychology. Devine's teaching and research interests include American politics, public opinion, political parties, campaigns and elections, the US presidency, political psychology, and constitutional law. Devine's research has been published in a variety or peer-reviewed journals, including Political Behavior, Political Psychology, Presidential Studies Quarterly, and Electoral Studies. He is the co-author of the book "The VP Advantage: How Running Mates Influence Home State Voting in Presidential Elections," with Kyle C. Kopko (Manchester University Press). His research on this and other topics has been featured in media outlets including The New York Times, The Wall Street Journal, The Washington Post, The Los Angeles Times, Politico, Time, US News & World Report, The Huffington Post, Fox News Channel, NPR, and more.